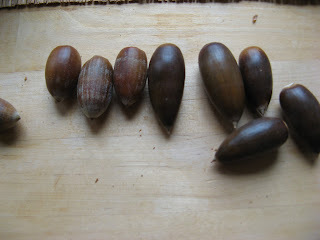 So as promised, here's a little more information about leaching the acorns. Acorns have tannins, a lot of tannins. 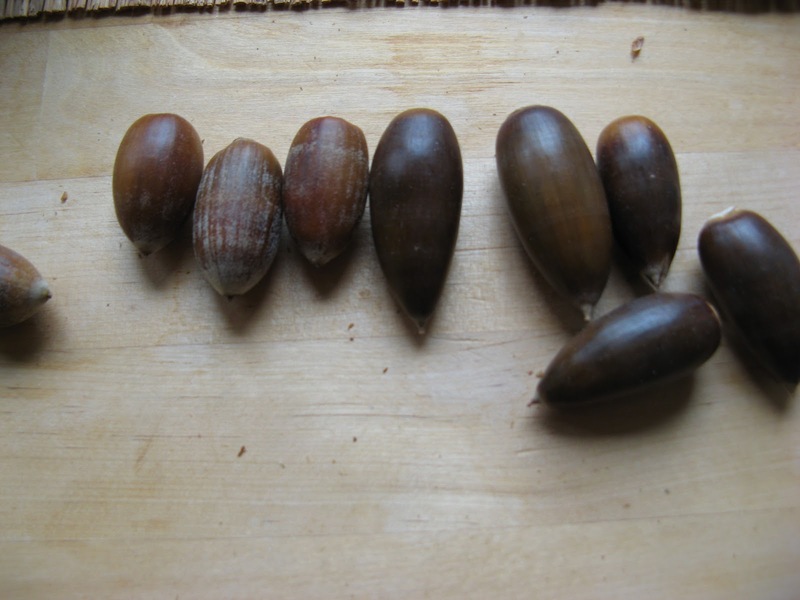 Most acorns have so many tannins that they are not edible without leaching. Some possible problems that I've read they can cause are constipation, stomach upset, nausea or even kidney failure. Yikes. So what to do. You have to leach the tannins out with water. First you have to grind or pound the acorns into flour. I used a spice/coffee grinder to do this the first time, and a blender the 2nd. With the blender make sure you don't put too much water or the bits of acorn will spin around without actually being chopped down Then to leach out the tannins there are many options. Native Californians diverted streams over beds in the sand, some people boil the acorns changing the water, or pour hot water over it, others pour cold water over the acorn flour, or tie it to a faucet in cheese cloth and let it drip over night. I opted for yet another option I found on page 5 of Suellen Ocean's "Acorns and Eat 'Em". I didn't need the flour right away, so I put the acorn flour in a jar and filled it with water. I shook it up and put it in the fridge to let the flour settle out. Once or twice a day I would pour the dark, tannin-filled water off the top, fill the jar with fresh water and put it back in the fridge. I read you need to do this for a week or 2, depending on the type of acorn, until the water gets clearer. After two weeks, the water was definitely lighter, but still pretty dark. So I decided to run some water through it. I lined a strainer with cheese cloth and dumped the acorn meal in. I left a small stream of water pouring out of the faucet to keep the strainer filled with water for a couple hours. Normally you do this overnight, but I had already leached a lot of the tannins out in the jar. I learned that cheesecloth is not the best method to do this. A lot of the acorn flour got stuck between the layers of cheesecloth. It was difficult to remove. So round 2 I used a linen dishcloth. Much better. I had no immediate need to use the flour, so I squeezed out as much water as possible, spread it out on a cookie sheet and put it in a warm oven. Stir it occasionally and break up any clumps. When you're sure it's dry you can store it. Many things I read said to store it in the fridge since acorn flour has a lot of oil and can go rancid if stored at room temperature for too long. Others said it's not a problem, but to be safe I stored it in the fridge. On my second round there was less flour. After two weeks the water was pretty clear. I put it in the strainer and just filled the strainer a few times until the water ran clear, then dried that flour as well. Now I had some flour to experiment with, which I'll describe in my next post.